Giapo notwithstanding, gelato and ice cream parlours aren’t always obvious places to find treats. With business models based on dairy products, it’s not surprising when they don’t cater to vegans. So this was a pleasant surprise: Casa Del Gelato in Mount Eden bakes fresh vegan double-chocolate chip cookies, and uses them to make vegan ice-cream sandwiches! About a third of the freezer cabinet at Casa Del Gelato is vegan-friendly, dairy-free sorbet. 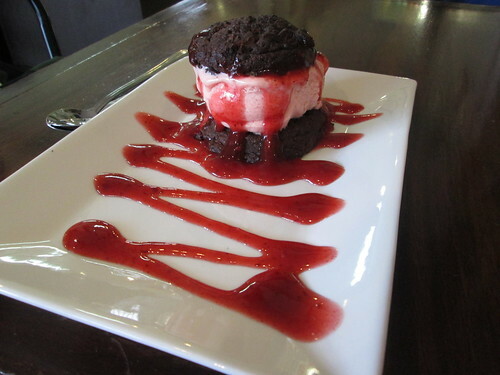 You can choose your favourite flavour (pictured: wild strawberry), and have it served between two cookies, drizzled with berry sauce. Both the cookies and the scoop of sorbet are generously-sized; this is a big plate of dessert. If you’re not hungry enough for a whole cookie sandwich, there’s also a cookie sundae on the menu, which is the same arrangement but with only one cookie. Casa Del Gelato is at 416 Mt Eden Road in the main Mount Eden Village shopping area. 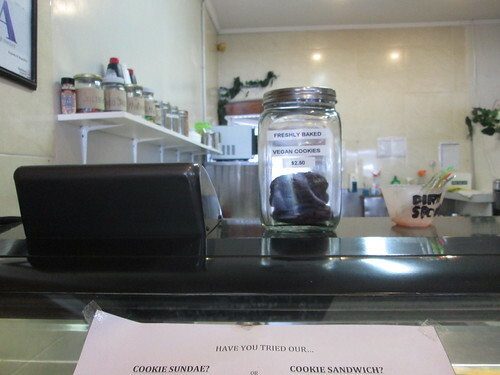 There are a few other branches of Casa Del Gelato around the city (the original one in Ponsonby, and others in Parnell, Birkenhead, Orewa, Milford, Victoria Park and Te Atatu) – all have a selection of vegan-friendly sorbet, but the cookie sandwiches are only available at Mount Eden.